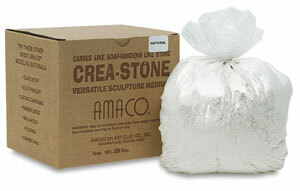 Crea-Stone is textured material for casting and carving. Just add water, mix, and cast in cartons to form blocks for carving. When first cast, Crea-Stone blocks are easy to carve, like soap. Aged three to four months, it becomes as hard as stone, yet about four times lighter. Smooth Crea-Stone with sandpaper or steel wool. This material is chip-resistant. Crea-Stone doesn't shrink or expand, and it is waterproof and fireproof. An exterior top coat is recommended for exterior applications. Non-organic, Crea-Stone can be painted with a brush or spray. It's also suitable for use with direct wire modeling or sand, clay, and wax casting. ® Amaco is a registered trademark of American Art Clay Company.™ Crea-Stone is a trademark.